As you work with the classes in your Java project, you will need to update the persistence.xml file to reflect the changes. 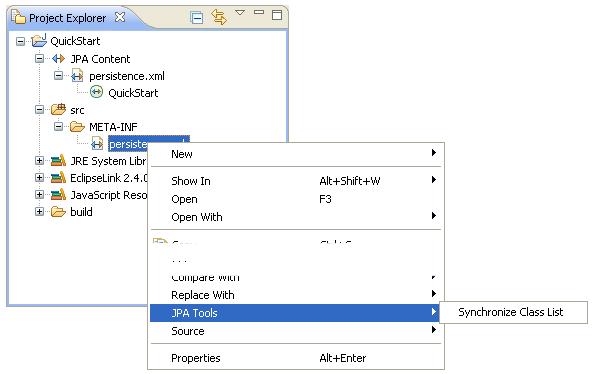 Right-click the persistence.xml file in the Project Explorer and select JPA Tools > Synchronize Class List. Use this function if you selected Annotated classes must be listed in the persistence.xml option in the JPA Facet page. In general, you do not have to use this function within the container. Dali adds the necessary <class> elements to the persistence.xml file. Use the persistence.xml Editor to continue editing the persistence.xml file.